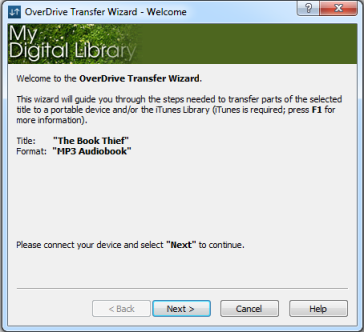 You can transfer audiobooks from your computer to your MP3 player using OverDrive for Windows (desktop). If you're using an iPod, use these instructions instead of the ones below, because transferring to iPods works a little differently. Note: We always recommend using the latest version of the OverDrive desktop app. Connect your MP3 player to your computer. Select an audiobook, then click Transfer . When your device is detected, make sure it's listed under "Player." Select the part(s) you want to transfer and click Next.